1998 proved a beautiful vintage, in particular at the low and the upper end of the scale. This wine tops everything as one of the finest QPR in Mosel history. Our 1998 retrospective with more than 30 wines re-tasted showed above all one thing: The vintage is pure fun with some true greatness, in particular at both ends of the must level scale. 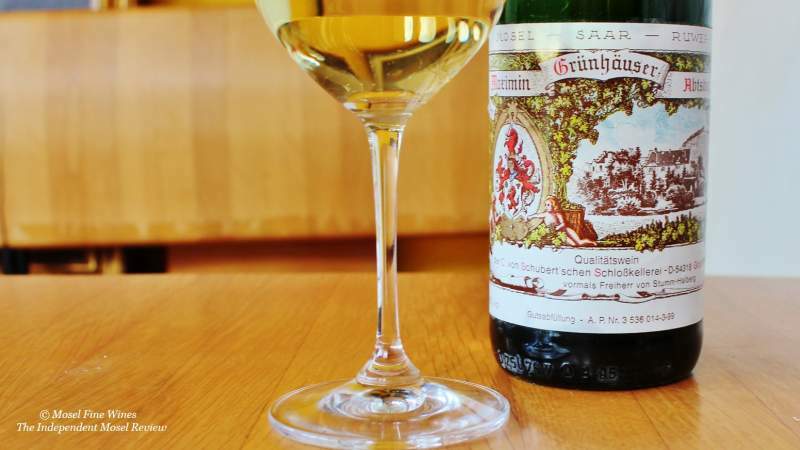 Many wines shone through, but one simply proved amazing: The “humble” Maximin Grünhäuser Abtsberg QbA 1998 by von Schubert. 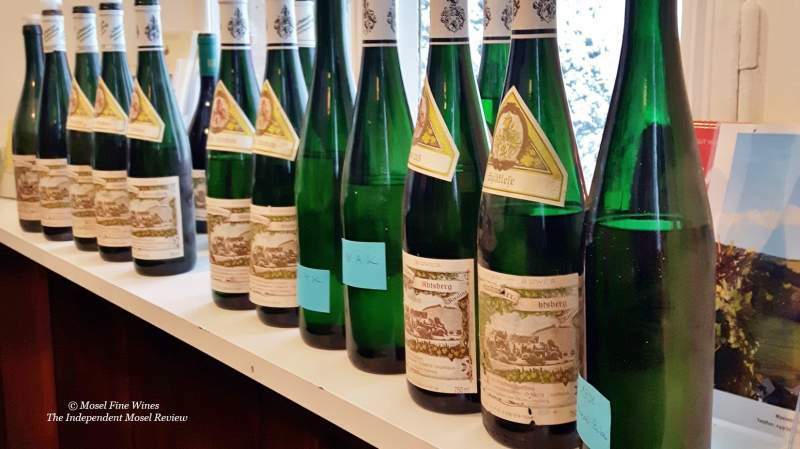 Over the years, we have gained a deep understanding of the wines from all leading Estates in the Mosel, and this over wines from the last decades. And one fact has come through time and time again: The incredible quality and consistency of the Weingut von Schubert during the 1990s. No other Estate produced such a string of successful wines in all stylistic directions during that decade. It is therefore not surprising that we have highlighted wines from this Estate as wines of the month in the context of the 1995 retrospective and the 1997 retrospective. We had the chance to re-taste much of the 1998 portfolio by von Schubert and also this collection includes some stunning successes which are truly singing now. Anyone still finding wines from the 1988-1998 period from this Estate should take the plunge, nearly whatever the cost. These wines are that thrilling! Today, the mention of a top single vineyard (such as the Abtsberg) for a dry or off-dry wine is reserved for the highest quality wines at von Schubert. This is also due to the fact that von Schubert rejoined the VDP and has to abide to these rules set by the VDP. Back in 1998, Weingut von Schubert, as most Estates, still structured its portfolio around the Prädikat scale. It was usual for von Schubert to produce a generic Estate “QbA” from each of its Grand Cru vineyards. Next to this, it would also offer a full portfolio of Prädikat wines, be them dry (Kabinett Trocken, Spätlese Trocken, etc. ), off-dry (Kabinett Feinherb, Spätlese Feinherb, etc.) or fruity-styled (Kabinett, Spätlese, etc.). THe 1998er Abtsberg QbA is therefore simply an entry level (Estate) wine made from fruit harvested in the Abtsberg vineyard. This wine was made in large quantities and offered at moderate price tag. And yet it turned into one of the greatest wines from the vintage, easily holding its own with the finest bottlings by famous growers. Is this the finest QPR ever in the Mosel? The Mosel has much to offer in terms of QPR, but this is, in any case, a serious contender. The wine shines through cassis and mint-driven vibrant freshness and a hint of creaminess adds complexity. This defies completely the notion of Estate wine. But it also shows that Estate wines can age beautifully. This is particularly true in the Mosel, where much high quality material ends up into such Estate bottlings. These Estate wines retain thereby a lot of terroir character and are surprisingly age-worthy. Long live the great Estate wines! The full 1998 retrospective with over 50 wines revisited can be found in the Mosel Fine Wines Issue No 40 (Apr 2018). You are a subscriber and miss this Issue? Simply send us a request by email and we will be happy to send you a copy. You are not yet a subscriber and wish to get this Issue? Subscribe free of charge by registering yourself here below and ask us for a copy by email.